Datacenters, remote offices, and small and medium-sized businesses (SMBs) are often limited by the amount of space available for compute resources. Budget constraints make it challenging for these businesses to keep up with the latest storage solutions that can benefit their business. 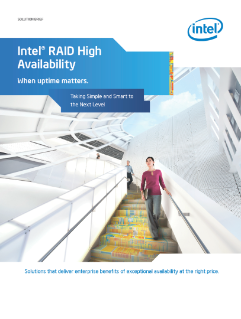 For businesses where cost and application uptime matters, the Intel RAID high availability premium feature ...kit, powered by LSI Syncro* Technology, allows for Intel’s intelligent RAID products to be upgraded to deliver the enterprise benefits of redundant, shareable, and scalable direct attached storage (DAS) at the right price. These simple and intelligent failover solutions reduce latency by half, at half the cost compared to other high-availability solutions. By combining two storage Intel® RAID Controllers with two servers, they provide a redundant, simplified server failover cluster. You can use an easy-to-install Intel RAID high availability premium feature upgrade kit with Intel RAID Controllers and two servers to further enhance storage applications and deliver higher return on investment for your server boards and systems to a just a bunch of disks (JBOD) configuration or in a single cluster-in-a-box (CiB) form factor.